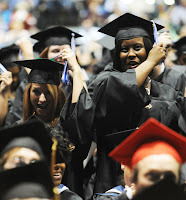 UIS celebrated the graduation of 1,294 bachelor's, master's and doctoral students on Saturday, May 14 during the 40th annual Commencement Ceremony. See a printable list of graduates' names and degrees listed by hometown below. For photos, video and more from Commencement 2011 visit www.uis.edu/commencement.